The original purpose of Hungarian embroidery on garments was to strengthen the hemline, but it later began appearing as decoration on both costume and household textiles. In the eighteenth century, free-hand floral designs of various stitch types began replacing the older geometric motifs. Wouldn’t this colorful floral design make a wonderful chair or footstool cover? The history of Hungarian embroidery goes back thousands of years. Early in its history, Hungarian weaving and embroidery was primarily a male profession. However, it was soon joined by women creating beautiful textiles for their clothing and their homes. 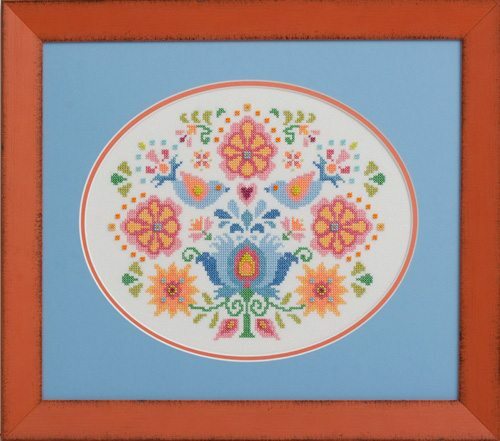 Although the practice of this lovely art is declining, the traditional motifs that have bloomed throughout all these years continue to remain an important expression of the Hungarian culture. Hungary proudly claims there are more than twenty folkloric regions, each with their own distinct motifs. This particular design is my own interpretation and culmination of the many beautiful embroideries I had the pleasure of viewing during my research, which I now present here in the art of cross-stitch rather than embroidery. General Information: Sulky 12 wt. Cotton Petites is similar to #12 Pearl Cotton floss. You only need to use 1 strand of thread over 2 threads of fabric. Fabric: Stitched on 25ct White Opalescent Lugana by Zweigart and provided by Needleworker’s Delight. Fibers: Uses a total of 9 colors of Sulky 12 wt. Cotton Petites thread. NOTE: Although Sullivans/DMC/and Anchor comparables have been provided, it is important to realize that these are “best match” colors and may not be exact matches.